Sooran is also called Zamikand or Zimikand in Hindi, Oal or Ol in Bengal or Elephant foot yam in English. There are many names in other Indian languages you can check here as I don't have a picture of the whole raw yam. This is an ugly looking tuber (actually corm) that doesn't look very appealing on supermarket shelves or even at the neighborhood subziwala, but if you have had a good curry cooked with it, you would hunt this vegetable like crazy. I have seen many people including my dad hunting for sooran whenever they don't get it. We had once grown a lot of sooran in our backyard long back but that variety was the one that causes itch. Although it was edible and super tasty when cooked rightly. Yes, sooran or suran as we call it, itches a lot if it is the desi variety. Desi sooran has many small bulbous outgrowths from the surface while the other variety is called 'bambaiyya' (meaning Bombay sooran) which has minor itchiness, bambaiyya sooran has a smooth outer skin. The itchiness in this tuber is due to a high concentration of oxalic acid that can be neutralized by washing it well, boiling it and marinating it with lime juice or tamarind juice. One needs to wear gloves or apply mustard oil while cutting sooran as it itches really bad when it does. If the itchiness is not treated well even the cooked curry causes a bad itch in the throat but I am not telling you to scare you, this information is just to let you know that this vegetable needs to be treated well before cooking. Especially if you are using the desi sooran. There is a tradition involved with sooran and it is considered auspicious on the day of Diwali. Sooran ki subzi was a must on Diwali at my parents place and I saw the same with Arvind's family as well. They probably had adopted the tradition of Banaras to eat sooran on the day of Diwali. Sooran is considered auspicious because it is a vegetable that grows by corms and some small corms remain in the Earth even after harvest and it grows in the next season by itself and spreads really fast. Diwali is a festival to grow and preserve wealth and this quality of sooran is considered auspicious, hence the tradition of eating sooran on Diwali. This sooran ki subzi is exactly like the one that was made at my parents' home. I sometimes cook the sooran ke shami kabab or sooran ka chokha when I am not in a mood for a spicy curry but this curry is one of the best recipes that has not changed a bit even in my hyper experimental kitchen. This sooran ki subzi has survived the test of time and enthusiasm of a mad experimenting cook. Some tastes are so comforting you want to bring back from past repeatedly. This is one of those. My mom and dadi (grandmother) used to treat sooran differently depending on what variety of sooran was brought from the local market. The desi one needed a longer marination in lime juice and sometimes they used a paste of Harad (a dry herb, a seed) or even a mix of amchoor, lime juice and tamarind sometimes. Some varieties of sooran are that dangerously itchy. But those who love this vegetable do anything to get the taste. Luckily now we get the bambaiyya variety of sooran more, but the bad thing is that the desi variety might get lost. Anyway, sooran would survive as the Diwali tradition ensures. Eating a particular green or vegetable on a certain festival has ensured many native varieties to survive and be available at least in the designated time. Coming to the recipe, this recipe is for the bambaiyya sooran that is not itchy at all. You would get the idea while chopping the corm if it is itchy so add lime juice, tamarind juice or a little vinegar after chopping the sooran and let it sit for a day before cooking if it is too itchy. Or an hour's marination is good. Harad is used in the form of spice paste and is ground along with the spices (1 harad for about 250 gm sooran), and gives the curry a darker hue. But the taste is great in any case. 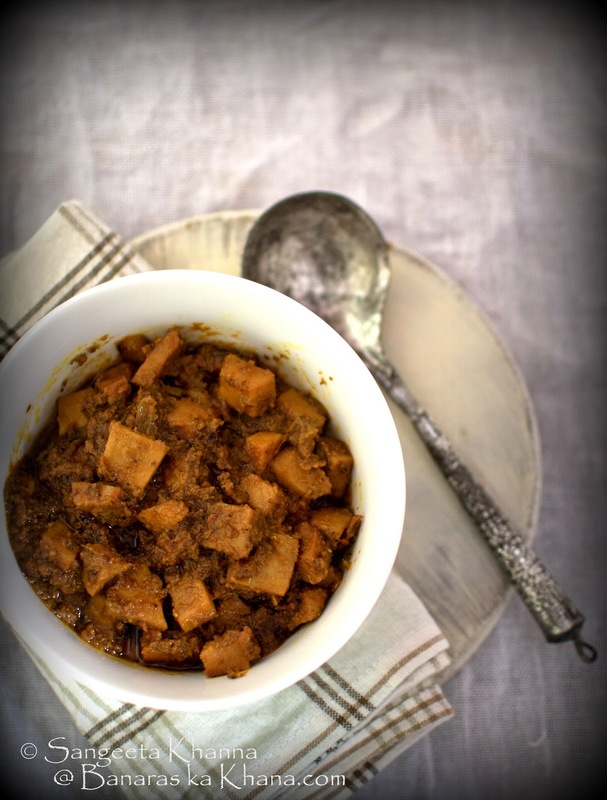 This recipe is a Jain recipe (without onion garlic), was made after the Diwali puja and we have always liked it this way. But I cooked this curry with some onion and garlic paste added and it tasted great that way too. Feel free to adapt the recipe if you are not looking for the real eastern UP version. 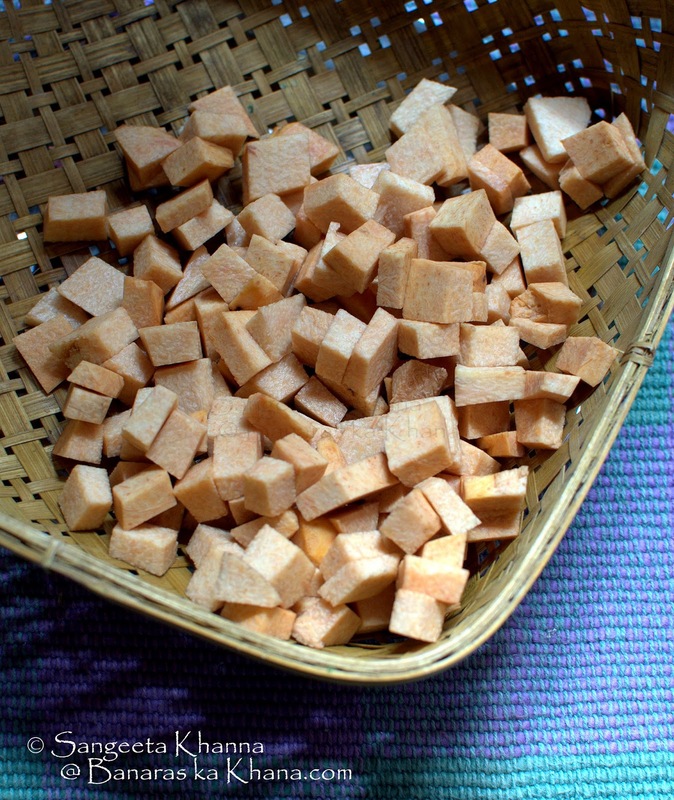 My mom used to deep fry the sooran cubes and I tried it that way a few times, it takes longer to get softened in the curry I noticed. Later I saw sooran being cooked straight away in watery medium (gravy) in some Kerala style curries and adapted my recipe to be cooked directly and not deep frying and it worked well. Though you can deep fry and proceed as per this recipe. I used the soorna cubes raw, added them after bhunoing the masala paste nicely before adding water and simmering it for a long time. Slow cooking is the best for such curries so don't be in a hurry for this please. Although pressure cooker gives close results but you never know how long the avaialble variety of sooran would take to cook. Make a wet paste of all the spices listed for paste, adding about 1/4 cup of water. Make a paste of tomatoes too in the same blender. Keep aside. Heat the oil in a deep and thick bottom pan and tip in the 1 tsp cumin seeds. Pour the masala paste as soon as the cumin splutters and stir to let it cook. Keep stirring and bhunoing on medium flame till the oil separates. Now add the salt and tomato paste and bhuno again till oil separates. Now add the cubed sooran, mix well, add about 2.5 cups of water and let the curry simmer for about 35-40 minutes on very low flame. The gravy would become thick and will be of coating consistency. Add amchoor powder and mix well. Garnish with dhaniya patta if you wish but I like this curry in it's own flavours and aromas. Serve hot but this curry tastes great even on room temperature. This sooran ki subzi keeps well in the fridge for a week, make it a large batch if you like it. It can also be frozen successfully without changing the texture or taste. 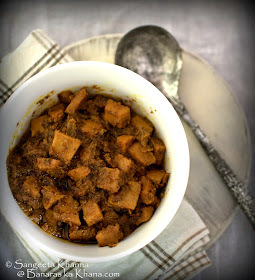 Note that if you find this sooran ki subzi itchy in the throat after cooking it, you just let the subzi rest for a couple of days in the fridge. It will get better as the souring agents used in the recipe will get time to work on sooran..
We enjoyed this subzi for 3 meals along with other green vegetables and salads but this subzi is not heavy on the tummy at all, it was not itchy sooran luckily. Sooran is considered very good for GI tract and for many other health conditions. Will write about that aspect some other time as this sooran ki subzi significance on Diwali write up has already become quite long. 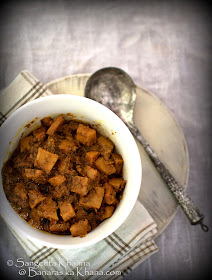 Don't wait till the next Diwali to make this sooran ki subzi, get some sooran and cook it this weekend and enjoy the subzi whole week if you like this. I am going to get more sooran for sure. 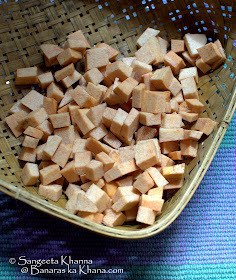 I have already made a chutney this season and have to experiment with a sooran ki subzi I tasted in Mysore. Will definitely share those too. Enjoy this recipe and others form this blog till then. It is not something I've seen before, but will now keep my eyes open for it. Yes it is the same Polly Oz. Sangeeta, I nearly had to visit a doctor when I ate a very itchy variety. I took a refund ( for the uneaten part, the guy sold me a kilo) from the shop keeper only to learn that another customer even made him pay for the medical expenses. We usually eat it boiled and mashed with green chilies, mustard oil and salt. It tastes divine with steaming hot rice. By the way once while I was passing through Lodhi Gardens few years ago I met a couple with a book in hand. It was my all time favourite "Trees of Delhi". A shy person by nature I gathered up enough courage to speak to them.I had a feeling the gentleman was a bureaucrat who had taken the day off to identify trees in the beautiful surroundings. Knowing now that you live nearby my intuition tells me It might have been you and Arvind. Most people I know in Delhi and other metro cities are strangely indifferent to plants and trees. The couple with the book meant a lot to me. Oh it must have been horrible to get severe itchiness due to sooran. The test is the itchiness in fingers when chopping it, I try and chop it bare hands just to be sure of how itchy it would be. Let's connect on fb if you are there. Thank you Sangeeta! Unfortunately I am not on facebook. I use up all my internet time surfing. And I am not disappointed by my honest mistake since i now know that you own the book and even use it. I really wish you would revive your blog "ayurveda on my plate". Few have knowledge on the amazing healing powers of natural substances. Today afternoon i found an illeterate woman with kalmegh plants. Her daughter is suffering from some allergies and she will feed her kalmegh extract with turmeric paste. I have planted Giloy and patharkuchi apart from the insulin plant and aloevera. I also have a huge neem tree. I hope you will consider my sincere request. Thank you for trusting me Aparna. I would definitely so something about the Ayurveda blog. Very soon. You dont add haldi to this curry? Turmeric is optional in this recipe of sooran ki subzi.